Absence is not abstract. It is felt and perceived. Absence implicates all of us inasmuch as it confounds the very writing of our stories. To see absence is to have our limits revealed, not as if in a mirror, but in a manner that shows that we are entangled with distant tethers that keep our bodies, our histories, in check. Absence, when made visible, is not observed immediately. It takes time. The April 26 opening of the National Memorial for Peace and Justice and the Legacy Museum in Montgomery, Alabama, is perhaps one such catalyst for the effacement of the visitor with respect to the racial terror that led to the loss of thousands of lives through lynching. 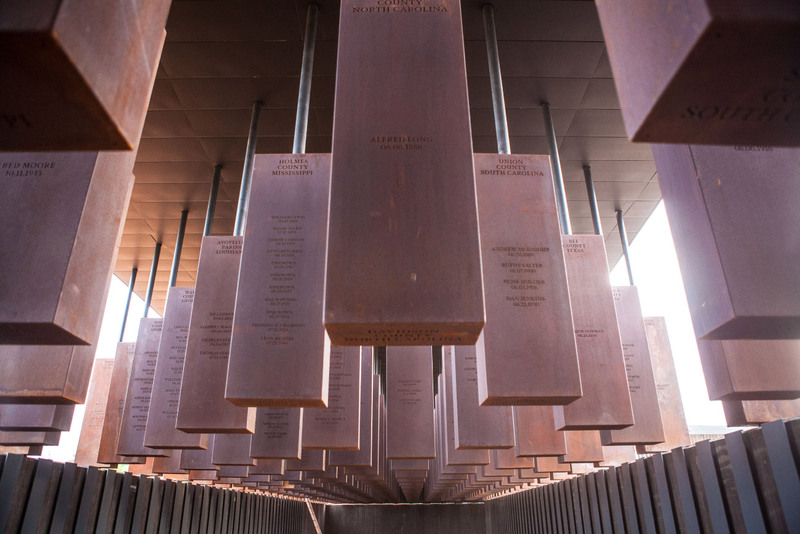 Lynching victims who were burned alive, hanged, shot—murdered—in and along the towns and byways of our nation from 1877 until 1950, are documented in this memorial initiated by the Equal Justice Initiative (EJI). Such violence continues today in the form of excessive imprisonment; by the murders of black women and men by the police; by the enforcement of state-sanctioned economic violence. By crafting spaces in which the subtractive is both a tool and a frame, the design of this memorial signals the recuperative agency of building as a means to affect the erasable and irascible conditions that established and purvey hatred, fear, and ignorance in this country. Here, looking away is not conscionable, as it moves against the habitus of memory, where our own individual pasts intersect with the Past. 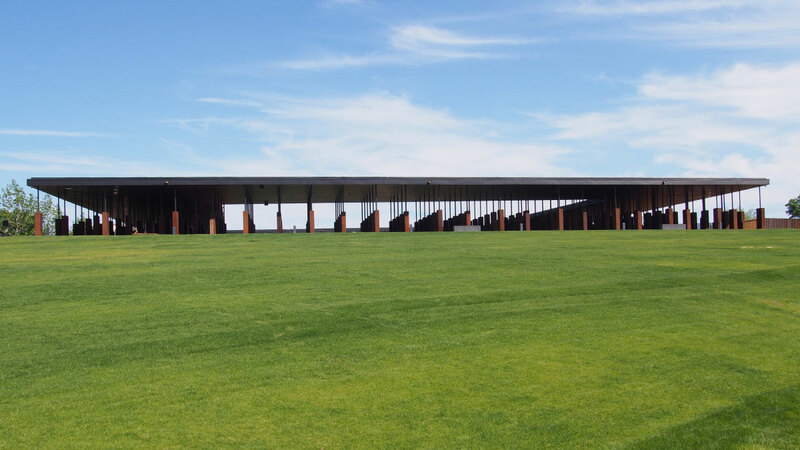 That the National Memorial for Peace and Justice and the Legacy Museum are realized in this, the 50th anniversary of the Memphis Sanitation Workers’ Strike and the Fair Housing Act of 1968, is indeed an extraordinary feat indebted to the efforts of many individuals that came before. However, I would be remiss in not reminding readers that in recent reportage, including The New York Times and Rolling Stone, there is scant mention of the architects. During the spectacle of the opening ceremony, EJI’s Executive Director, Bryan Stevenson, acknowledged builders, contractors, laborers, and “local” architects—but did not name the project architects, MASS Design Group. Only on the EJI website can we find mention that the Initiative had the “assistance” of MASS Design Group. It feels purposeful, and we are thus left to speculate. I am left wondering: Are architects supposed to fade away in the fashioning of a memorial? I can think of recent examples for which this is clearly not the case. What has been wrought in other locations, including Washington, D.C., Berlin, Johannesburg, New York City, and Birmingham, all speak through their authors. And, in varying degrees, formal aspects of each of these memorial spaces are present now in Montgomery. Memorials render ghosts. And Boston-based MASS Design’s work with the EJI on the design and building of this structure is no less haunted by the iniquities of American history. With distant views of limpid hills and a semiformal state capitol town center with its empty shops, deserted lots, 59 Confederate markers, and recent loft conversions, the Memorial for Peace and Justice is adjacent, without irony, to the storefront of the State of Alabama Office of Pardons and Paroles Day Reporting Center. From the street below, the memorial structure is partially indiscernible due to its horizontal profile cutting across the sightline, but it may also be read as an empty pedestal through and on which the lives of so many passed, passed away, disappeared. One climbs farther up the hill alongside a boundary wall upon which a series of chronological narratives is posted to convey the story of “Why here?” and “Why now?” The manifestations of slavery, of incipient racism that persist today, are described as a backdrop to an unfolding of both landscape and architecture as marked sites for unceasing brutality. 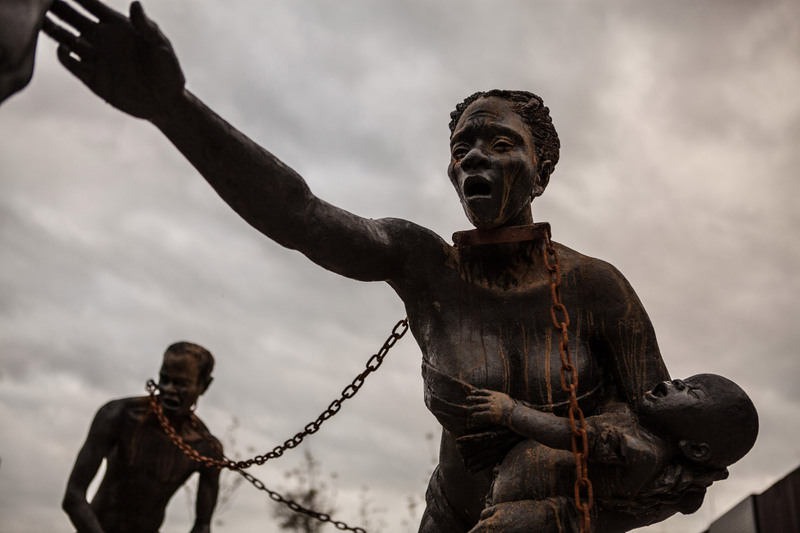 We are soon confronted by a bronze sculpture of humans in chains by Kwame Akoto-Bamfo. The signs begin too high to be read easily and meet our eyes as we climb the hill. A sharp corner, and one rises again to the structure while unfortunately overlooking the conclusion of the memorial space one floor below. There is no fixed entrance, per se, except a momentary pause with a large fire extinguisher. Stepping onto a timber floor, one is immediately surrounded by a dense array of body-size steel casks hung from pipes that disappear into a paneled metal ceiling. 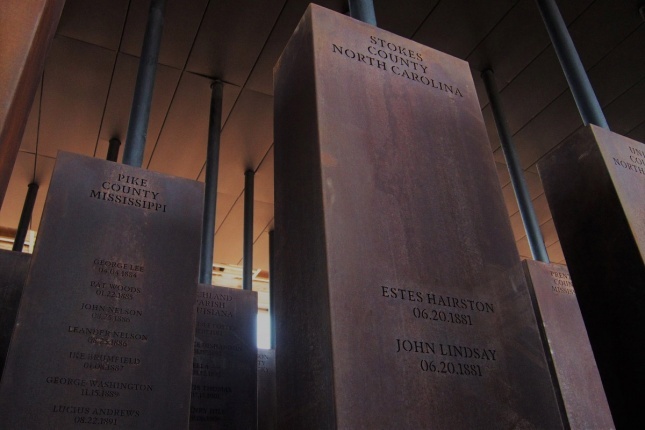 One moves cautiously through a grid of “bleeding” Corten steel containers, each incised with the name of the county and names accompanied by dates, including those unknown, of the lynched. The floor gradually descends as the casks remain above our heads; their intact volumes remain whole. By moving downward, one returns into the ground. The horizon has been excised. Gravity is idle. 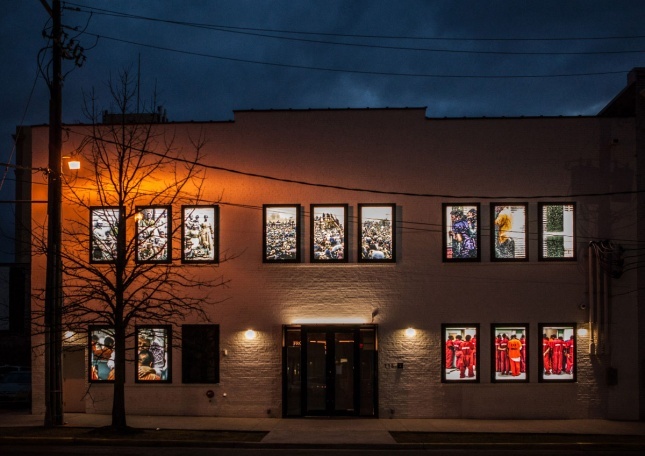 A series of narratives printed on thin metal strips is hung in a similar manner to the initial chronologies, describing in the briefest of ways the events of individual lynchings. The blunt quotidian language, their facticity, arrests our movements. At the next corner, one is presented with two very large indictments. A cascade of water pushes across the adjacent wall, merging with, not obscuring, an extended text. The temperature changes. Two choices are apparent: Climb a ramp or stair into the center of the quadrangle or leave. The empty center, while perhaps disguised as a space of confrontation, is more like a cloister in which condemnation is subdued, internalized; here it is possible to see across through the casks while observing others. It is not a sanctum. Greeting one’s unceremonial departure from the memorial upon moving outside, another sliver of text is located across from the pipes and pumps of the interior waterfall. This is not as much a “door of no return,” as merely a way out. This non-exit merges with an unmarked landscape of horizontal metal casks, akin to those held inside the structure—a topology of loss. Despite being worrisome for those who might wish to touch one of the steel containers after a hot day, one walks between their seemingly geographic order(s) locating states and counties, and names. Farther on, a series of bronzes by Dana King, depicting Rosa Parks and her heroic companions leading the Montgomery Bus Boycott, intersects the path. A small circular garden of mushroom-like concrete stools is sited nearby and is unlike anything seen elsewhere, with no explanation as to its role. One moves across on pathways above, around, and below another bronze, this one by Hank Willis Thomas, spelling bodies of containment, of stability falling away. With the building of such thresholds for historical reckoning, the arc of our knowing also asserts unknowing; absence lingers. 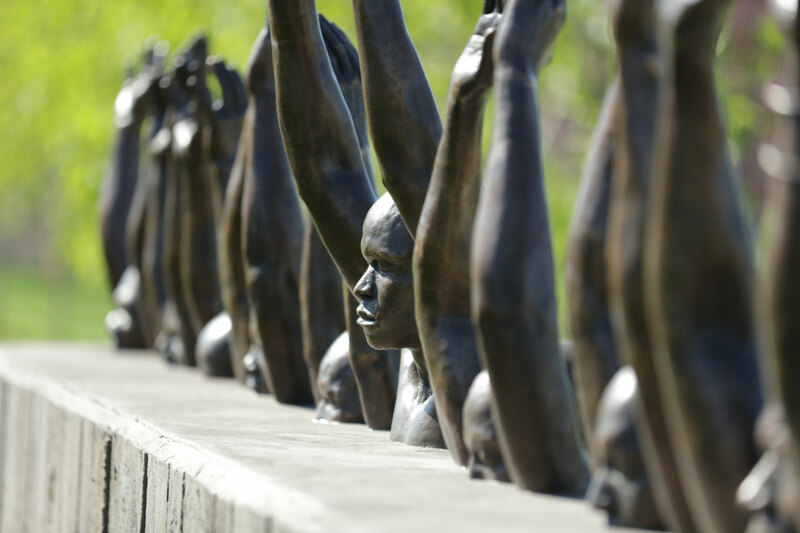 The National Memorial for Peace and Justice and the Legacy Museum attest to our own entanglements with reconciliation and truth. Memorials, like museums, are structures that attempt to keep us in their grasp as long as possible, allowing for the disclosure of our interior selves with multiple worlds. Such “new worlds” are partially uncovered at the intersection of reflection and remembrance, yet allow for and point to the rupture of what our passages have been and continue to be.